The law enforcement physical agility test is a moment in the police application process where candidates have the opportunity to really set themselves apart from the rest of their group. It is a time where you can look at your score and directly compare yourself to those who you are competing against. While this is great for those candidates who are naturally athletic and are able to do everything that is asked of them, it can be a bit scary for candidates who lack confidence in their athletic abilities. The interesting thing is that pure athleticism, while helpful, is not a guarantee that one will be successful in the police fitness test. This is because the test is not created to identify athleticism, but rather to identify ability in specific physical requirements that police officers will likely encounter on the job. This is an equalizing factor, as many sports-oriented athletes will lack specific skills for the fitness test. If you don’t already know it, you can review your states’s physical fitness standards by visiting Stew Smith Fitness for military and law enforcement. I often get asked how to prepare for the test. Many candidates assume that bulking up on muscle or training for a marathon is key; after all, these are two of the most physically-demanding aspects of fitness. The problem with this is that the fitness tests require you to do both strength and endurance activities, as well as agility activities. Too much emphasis in one area guarantees a lack of emphasis in the other areas – you need to be well rounded and able in all three categories in order to be successful. The most important thing that a candidate can do is to actively work towards a healthy lifestyle. This does not mean moving into the YMCA, but rather being aware of the effect each decision you make has on your bodily fitness. This is the starting point for meeting the physical requirements, and it needs to be started early – if you wait until your police academy fitness test to start living healthily, you will fail the entrance test. Follow a customized daily food plan so you’ll know the amount of food groups you need. Get 8 hours of sleep each night. Sleep helps your body heal, improves mental alertness, and increases energy. Eat a good breakfast. Your day will start off with sufficient nutritional value. Perhaps focus on adding protein or omega fatty acids here to improve nutrition and brain health. Don’t smoke. There are no health benefits to smoking, and lots of detriments that will hurt you during the testing, specifically in your endurance. Don’t drink (too much). Cut down on your imbibing. Alcoholic beverages tend to be high in sugars and carbs, two elements that you will want to cut out of your diet. As well, a workout is tougher to get through when you’re hung over, meaning that your next workout will be less effective. Be active outside. Daily activities such as running or walking the dog are key to effective fitness lifestyles. The fresh air is also invigorating, and often a natural setting will reduce stress levels more than a gym setting. Drink lots of water. Water is much better for you than sugary drinks; it offers more hydration without the sugar that will hurt your fitness levels. If you are drinking sports drinks with electrolytes, make sure that you are also drinking water along with them; if not, the electrolytes (which are a type of salt) will dehydrate rather than re-hydrate you. A major part of the active lifestyle needed to be a police officer is the food one eats. The old stereotype of the police officer eating doughnuts and drinking coffee is false – there is no way that the fitness requirements could be met on a diet so heavy on carbs and caffeinated beverages. Officers focus on having lean muscle, and so should candidates looking to pass the physical fitness testing. To put on lean muscle, your diet should be focused on two specific areas – protein and fiber. Protein is the one element that everyone focuses on. The more protein you have, the more muscle you grow, right? Well, yes, it is true. However, if you’re taking on a lot of protein through fatty meats or powdered workout shakes, you’ll be putting on bulky muscle which can ultimately slow you down and hinder your flexibility. Lean proteins can be found in meats such as lean steak, fish, or poultry. These meats offer proteins that, when broken down, will strengthen muscles while adding as little additional fat content as possible. This allows your body to focus on creating more muscle while lowering your BMI and body-fat percentages. Essentially, these proteins offer all the benefits, but with fewer drawbacks than fattier meats. Lean proteins can also be found in nuts and seeds. The best way to gain these proteins is to eat the nuts or seeds plain – toppings tend to increase salt or sugar levels, especially in peanuts. These nuts and seeds also are a good source of healthy oils, which will also aid in your quest for personal fitness. To improve your fiber intake, follow your mother’s advice: eat your fruits and veggies. This food group tends to offer lots of fiber (especially when eaten raw), which aids in appetite control and metabolism, among other things. Fiber can also be found in grains such as oats, as well as other grains’ bran (which is the outer coating of the grain that is not usually used for flour). Eating oatmeal or bran flakes for breakfast, as well as adding fruits and vegetables throughout your meals, will help you to get in shape by giving your body the proper energy it needs. Only after you have made the proper lifestyle changes will your physical training become efficient and effective. This is where a proper choice of exercises and training will be key to successfully passing the fitness test. While I will not go into these in this blog post, my advanced training program is available online. The reason that these lifestyle changes are so important is that you are attempting to get a job where you will need to maintain this lifestyle. These changes will set you up for success in your training for the fitness test. 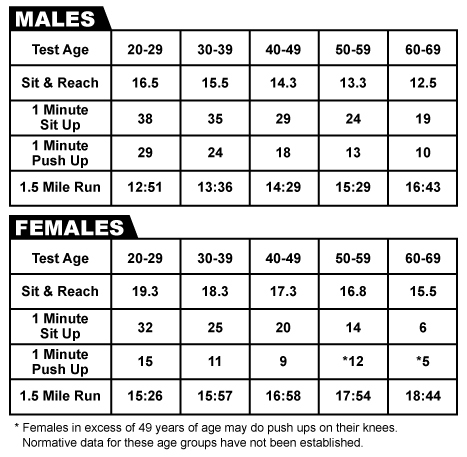 They will also help you pass the law enforcement academy fitness test, which is more strenuous than the initial fitness test. Finally, they will help you maintain your fitness level at a rate where you can be the best officer possible – this is where your training and your ultimate goal meet. The Philadelphia Police Department was gracious enough to provide an easy to follow exercise routine for those preparing for the fitness test. You can visit the link to download the all-in-one workout plan for police recruits.